Air Krete® Injection Foam is non-toxic, fast, economical, and efficient. Unlike messy polyurethane-based foams, it is a cementitious foam that actually absorbs Carbon pollution from the atmosphere. It just takes 3 steps to surround your living space with foam insulation that stops drafts, increases the thermal resistance (R-value), and cuts the cost of staying comfortable. Dr. Energy Saver Of Connecticut is your trusted resource for injection foam insulation in Connecticut, Connecticut. Air Krete® uses proven revolutionary technology to deliver leading performance, safety, comfort and durability. Air Krete® is an excellent retrofit choice for wood, vinyl, and aluminum-sided homes, as well as brick stucco or block. If you are in need of an insulation upgrade, contact Dr. Energy Saver Of Connecticut for a Free Estimate for injection foam insulation in Hartford, New Haven, Greenwich, Norwalk, Danbury, Stamford and all surrounding cities and towns! Super energy efficient. Like spray foam insulation, Air Krete® combines the benefits of air sealing with high R-value. The injection foam effectively seals around edges to protect against infiltrating air. Air Krete® is rated at R-3.9 at 2.07lbs/ft3. Fire-resistant, mold-proof, pest deterring. Air Krete® is used a fire-stop material and passed a 2-hour fire wall test. The injection foam material has proven to be resistant to mold growth at both 75% and 95% relative humidity. Air Krete® is also pest resistant because of its deoiling/drying effect on pests. Perfect for retrofit applications. Many 2-part foams can’t be sprayed into a finished wood-frame wall because high expansion rates will cause the wallboard to bow or even pop off the wall. Air Krete® is non-expanding and is extremely flexible. It’s designed to flow and fill around electrical wires, outlet boxes and existing underperforming insulation. It’s a great way to give an existing house a comfort and energy-efficiency makeover. A no-mess retrofit solution. The average Air Krete® injection foam application in a home takes less than two days and is applied through the exterior walls and in the attic to deliver comfortable living and energy savings. Injection foam does not expand after it’s applied, so it won’t cause damage when injected into a wall cavity or other building cavity. In fact, the foam has ideal qualities for upgrading wall insulation levels. (It’s sometimes referred to as “wall injection foam.”) Once holes are drilled in the wall (from inside or outside the house) to provide access to each stud bay, an application hose is inserted and the injection foam is applied. With the consistency of shaving cream, the foam can totally fill an empty cavity or flow around an existing fiberglass batt, eliminating air spaces (voids) and sealing all air leaks before the foam hardens. Access holes are filled with wood or foam plugs when the installation is complete. Injection foam can transform leaky, energy-wasting walls into airtight, well-insulated walls that improve interior comfort and reduce monthly utility expenses. Unlike SPF, injectable foam is not super-sticky and difficult to remove when excess foam attaches itself to finished surfaces. Injection foam simply washes off with water. It’s safe during and after installation because it outgases no harmful fumes. Call 1-855-201-5406 or contact us online to schedule a free home inspection and home insulation estimate. We also offer a comprehensive home energy evaluation to properly identify and diagnose your home's leaks and suggest the appropriate repairs. We are the authority in Air Krete® injection foam insulation and many types of home insulation in Connecticut. 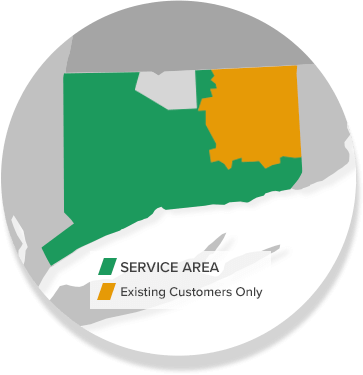 Contact us for a Free Estimate in Norwalk, Danbury, Stamford, Greenwich, New Haven, Hartford, New Canaan, Westport, Darien, Ridgefield, Hamden, West Hartford, and more! We are the authority in injection foam insulation in Connecticut. Contact us for a Free Estimate in Norwalk, Danbury, Stamford, Greenwich, New Haven, Hartford, New Canaan, Westport, Darien, Ridgefield, Hamden, West Hartford, Cheshire, Milford, Trumbull, Shelton, Bridgeport, Waterbury, New Britain, Bristol, Meriden, Glastonbury, Monroe, Stratford and more!